God, I love this King Kong poster. It's big, pulpy, scary and thrilling in all the right ways, with the title gorilla barrelling through Skull Island's temple doors, almost exploding with fury, bathed in fiery, hellish shades of red, orange and yellow. If there's a better way to capture the unstoppable rage and might of the character, no one else has yet to stumble upon it. Had I been a youngster in 1933, nothing short of divine intervention could have prevented me from skeedaddling to the local movie house and slapping down 25 cents for this humdinger of a talkie! No, siree! Like the very best one-sheets of the period, this evocative piece of advertising manages to flawlessly convey the sensational feeling of a lost era; an exploratory time when the possibility still existed that maybe, just maybe, there were still undiscovered lands left to uncover. Lands filled with fearsome gargantuan creatures still stalking the earth, untamed by human civilization. It also powerfully speaks to the deliriously imaginative dreams (or nightmares) that so many cinephiles, of all ages, journey to the theatres to see magically realized in front of their eyes. 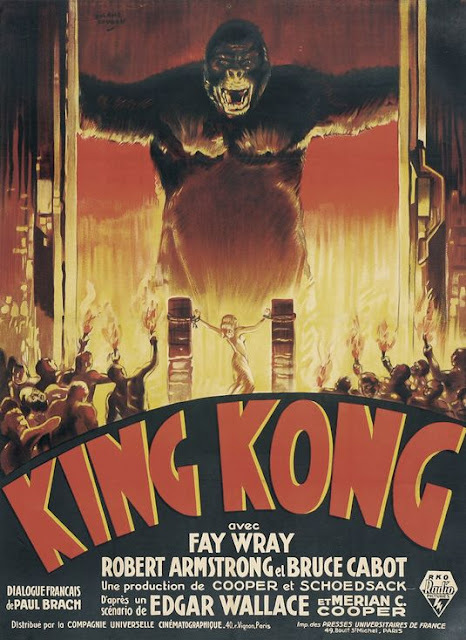 It's notable that this poster solely promotes the edge-of-your-seat adventure of King Kong, not the earnest sense of wonder or the heart-string tugging finale. That's just smart marketing. Lure 'em in with promises of bold, unforgettable sights, then hit them with the emotion and message. That said, traces of Kong's veiled sexual politics still remain present. Notice the placement of Ann Darrow in reference to the towering simian's anatomy. I'd say it is pretty unlikely that that was merely a coincidental artistic touch. Regardless, this one-sheet manages to out-cool the competition. I own a replica print, as well as a t-shirt bearing its likeness, yet still never grow tired of gazing at it. No doubt about it, when it comes to motion picture one-sheets, this Kong poster is still king.